Powerful 25W Battery Powered Megaphone Loud Hailer Horn with built in siren and car cigarette lighter plug for DC plug for external 12Vdc operation. Up to a 1Km range. Ideal for general elections etc. 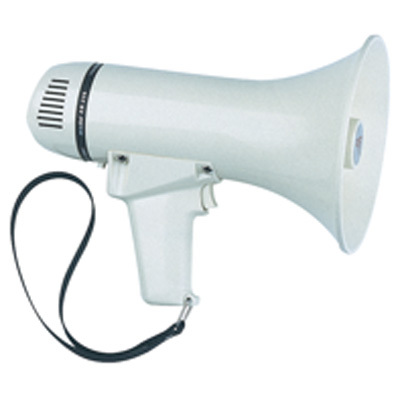 White 5W High Output ABS Plastic Megaphone With Volume Control and Wrist Strap. Powered By 8 x AA Batteries (Not Supplied) Perfect for School Gyms, Hall, or Group Sessions.